The sleepy north-east hamlet of Westhill had a population of fewer than 100 people in 1961. But it all changed with the arrival of the oil industry, leading to a massive explosion in the population and Westhill becoming the centre of the European subsea industry. The town now has a population of over 11,000 and is estimated to be home to more than 20 subsea firms with at least 5,000 staff between them. Industry body Subsea UK has 10 members at Westhill alone turning over nearly £2billion and employing 2,300. As a result, the town is widely recognised as a centre of the global subsea industry. Its nickname, Surf City – standing for the key components of subsea operations: subsea, umbilical, risers and flowlines – is even printed on town signs. This week, Subsea UK is making the town its new headquarters, moving from Bridge of Don, in Aberdeen. Angus MacCuish, managing director of letting agent FG Burnett, said Westhill’s success was the result of wise planning by Aberdeenshire Council. He said: “The concept of Westhill as a planned settlement goes back to the late 1960s. “Westhill was always reckoned to be a solid location, readily accessible from the north, west and south, also Deeside and Donside; it is quite strategic in that sense. 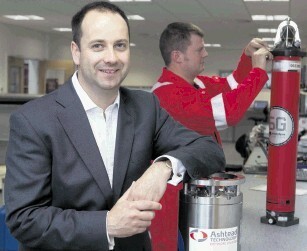 The first subsea firm thought to have set up in the town was Divex. 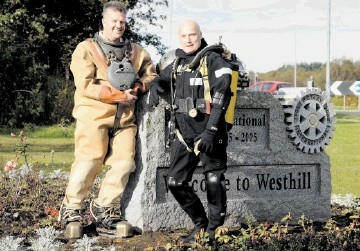 Under US businessman and ex-navy diver Don Rodocker, who lived at nearby Elrick, the firm took Unit 7, one of the few business premises available – now a Post Office depot – in 1980 under its then name Gas Services Offshore. Derek Clarke, who joined the business in 1987 and led a buyout in 1990, said the only other firm there at that time was National Oilwell Varco (NOV). Schlumberger then moved in, followed by Stena (now Technip), and so the town’s transformation started. In 1997, plans to build the first phase of the 10-acre Arnhall Business Park were approved, with a further 47 acres, phase II, then agreed in 2004. The growth has not been without its problems. In 2004 there were calls to limit the school roll at Westhill Academy, which was opened in 1979 for 500 pupils and expanded in 1982 and again in 1996. Traffic has also been a rising concern, however, Mr Clarke thinks when the western peripheral route is finally built the location of Westhill will be even more prime. Indications are the growth will not stop yet. For example, earlier this year subsea service firm Hallin Marine moved into new £30million premises, taking fellow Hallin company, engineering consultant Prospect, with it. Aberdeenshire Council also gave the go-ahead for a third major expansion of the Arnhall Business Park, opening up a further 30 acres of land. In addition, the council has set itself a goal of making Westhill a recognised global centre of excellence and said it could build a subsea knowledge hub by 2016. It is a significant and globally growing market, said Neil Gordon, chief executive of Subsea UK, adding: “There’s a lot of confidence in the subsea market in the UK and being in the market gives people a lot of credibility because of the business being done here, which gives them a spring board to the export markets. That engineering base not only controls much of the subsea fleet, but is also a creator of new technology. Earlier this year Subsea 7 launched a new autonomous inspection vehicle (AIV) aimed at lengthening field life and reducing costs, designed out of Westhill. Equipment is also manufactured in the town. Divex, for example, not only assembles its diving equipment, but also manufactures the parts and tests them at its site.